Blogging platform Tumblr has deleted 84 accounts it says Russian propagandists used to spread disinformation during the 2016 US election. The accounts are believed to have been used by Russia’s Internet Research Agency (IRA) – an organisation linked to many different web-based campaigns. 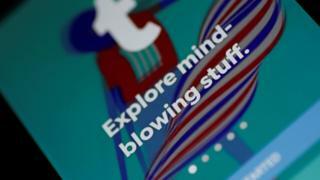 Tumblr said it had uncovered the fake accounts while helping an official investigation into the IRA’s influence. Last month, 13 Russians linked with the IRA were indicted by the US government. The individuals were charged with trying to manipulate American voters via social media. But the continuing official investigation into the activities of the IRA had prevented it releasing details before now. Tumblr said it would also let anyone who had interacted with the fake accounts know what had happened. “We’re committed to transparency and want you to know everything that we know,” it said in a statement. Tumblr said it would let individual users decide whether they wanted to delete the chains of links and comments they had added to the Russian posts, which were “often challenging or debunking the false and incendiary claims in the IRA-linked original post”. And it would step up monitoring of its own service in an attempt to stop future abuse by state-backed trolls and propaganda units. Other social media services have purged themselves of allegedly IRA-backed accounts in recent months. Last year, Facebook said 120 Russian-backed pages had created 80,000 posts received by more than 29 million Americans directly. The information reached many more as those initial viewers passed them on to others. In December, Facebook introduced a tool that it said would let users know if they had interacted with the IRA-backed accounts. Earlier this month, social-news network Reddit said it had removed “hundreds” of accounts it suspected of being used by the IRA. In February, Twitter removed many thousands of so-called “‘bot” accounts it said were being used to artificially inflate the importance of messages sent by Russian social-media workers.